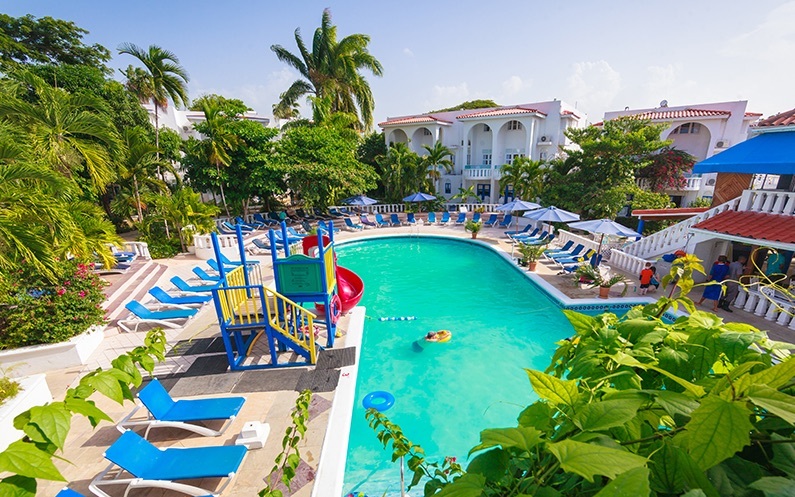 Franklyn D. Resort & Spa is an all-inclusive resort located on the beach in Runaway Bay, Jamaica. The resort is great for families, with perks like a personal vacation nanny, a huge water slide, and suites with multiple bedrooms. Adults can enjoy an unlimited premium bar, relaxing spa, and a kids-free disco after 9 p.m. The resort features 78 air-conditioned rooms featuring kitchenettes with full-sized refrigerators/freezers and stovetops. There are one-, two-, and three-bedroom suites available with separate living and dining areas. All rooms have private balconies or patios. Cable programming and DVD players are provided for your entertainment, while complimentary wireless Internet access keeps you connected. Conveniences include phones, as well as safes and separate sitting areas. Pamper yourself with onsite massages, body treatments, and facials at the Seagrape Spa. There are three outdoor swimming pools, a small beach, and a fitness center. This resort also features complimentary wireless Internet access, complimentary babysitting/childcare, and supervised childcare/activities. The onsite disco allows kids up until 9 p.m. each night, and teens until 10:30 p.m. There are four restaurants at the resort: The Verandah Restaurant serves buffet breakfast and lunch daily, and some a la carte dinner along with weekly theme buffets; The Pier Restaurant is an adults-only Italian restaurant; Overproof Restaurant is also an adults-only restaurant, open two nights a week and serving Jamaican specialities; and The Sea Cotton Tree Grill, offering casual sandwiches and grilled items until midnight. All premium brand bar drinks, beer and wine are included in the all-inclusive price. Wine is served with lunch and dinner. Guests can enjoy drinks in the main bar, which transforms into a piano lounge with live music each evening.